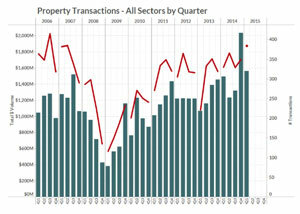 Investment in Greater Vancouver commercial real estate has been building nearly every quarter since the market-correction low of early 2009, but activity in the first quarter of 2015 still set a record in terms of overall investment. Last year closed with an all-time quarterly record in terms of overall investment and the most recent quarter ranks as the second-best to date, according to the RealNet Canada Inc. real estate information services company. “The lending environment has made it possible for business owners to acquire or improve their current facilities,” said RealNet research director Paul Richter, who added low interest rates are enabling tenants to borrow money and become property owners. Most of the major transactions that occurred in the first quarter of 2015 were properties poised for development or redevelopment (see list below). There were 384 transactions worth more than $1 million in the first quarter, adding up to a total of $1.6 billion. Private investors from Canada and elsewhere are responsible for a large portion of the spending. “We have certainly seen a number of known foreign investors active in the market in both the larger-built assets as well as in long-term redevelopment plays,” said Richter. The retail sector recorded a three per cent increase in overall investment while the apartment and office sectors improved by 37 per cent and 55 per cent respectively. The industrial sector declined slightly compared to the previous quarter, but overall volumes continue to be at near-peak levels. Residential land accounted for 27.9 per cent of the overall investment total, while industrial, commercial or institutional land was responsible for 20.4 per cent. Their values were a combined $752.5 million. The majority of residential transactions are taking place in the City of Vancouver and along major transit routes further from the core. Developers are assembling property strips along busy corridors and rezoning them to accommodate mixed-use development with retail at grade and residential units above grade. Investment in industrial, commercial or institutional land was more spread out, with the majority of the larger transactions taking place in the City of Vancouver and nearby municipalities such as Richmond. Other municipalities are key contributors in terms of the volume of relatively smaller transactions. * and downtown residential sites at 150 Robson and 118 Robson streets across from BC Place comprising 0.52 acres that were acquired by Amacon for $32.55 million. “With the exception of the Pattison-purchased industrial site, I expect to see major changes in each of these properties in the future,” said Richter.